This page allows you to find directions, post a comment, read reviews, and check rates at the Seville Hotel. 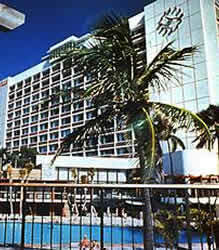 The Seville is a recently renovated, oceanfront hotel. It is close to the Miami Beach Covention Center and Art Deco District. WARNING: Do NOT purchase a tour from the concierge at the Saville; they are in cahoots with an unprofessional tour operator, who pays them large commissions, which are added to your cost. Click HERE for Seville Beach Lodging Information. • The Seville Beach is on the Right (East) side of the street. The Seville is located at 2901 Collins Ave., Miami Beach, FL 33139. Use our Miami hotel map to find the exact location. Seville Beach Hotel in Miami Beach. Miami hotel reservations.